ME: I don’t understand; can you use your words to tell me more? ME: Thank you! Here you go. I hand Nik two tic tac candies. It’s a game we play each morning. It started years ago as a way of encouraging counting skills. Clearly, we are beyond that now and we have modified it over time. Now, I use this same exchange to work on language skills and, sometimes, concepts. ME: I understand, but you just had two. You need to wait. ME: Tell you what, buddy, you may have three and four after we pass the fire station. As I hear the words come from my mouth, it occurs to me—I don’t know if Nik really understands. We don’t exactly narrate our daily travels anymore and we don’t know any firefighters. Other than a character in a story, I’m not sure Nik’s really been exposed to the idea of a fire station. I mean, we drive past the large brick edifice multiple times a day—on the way to school, on the way home, when we go to the store, the park, the pool. It is a landmark known to everyone because of both its importance and its location. We take it for granted as simply another part of the scenery. NIK: Three, four. Now, please, Mama. ME: No, sweetie. You need to wait until we get to the fire station. Do you know where that is? I see Nik sign “yes” in the mirror, but I’m not convinced he really knows. As we approach the intersection, the light turns red; I ask Nik to point to the fire station. He points, vaguely, to the right side of the car; the fire station is on the left. Realizing he doesn’t know what I’m talking about, my heart lurches a little. In that instant, it becomes vitally important to me that my son understands what the fire house is and where it is— as if it’s a confirmation that he does, indeed, have things in common with his typical peers. After all, all boys love fire houses and fire engines, right? I sigh, wistfully, and remind myself that it’s okay if he doesn’t. Maybe. ME: (clearly refusing to give up as I point to the fire house on the opposite corner) Nik, look. That’s the fire station. It’s the house where the fire engines live. Can you see it, buddy? NIK: Fire engine.house. Fire engine house. Inside. ME: Oh, sweetie, we can’t go inside. We have to go to school. The light changes and we begin to drive. I tell myself it’s a start; we can keep working on it. As we drive past the fire station, I hear some rapid vocalizations from Nik followed by a flurry of beeps from his device. NIK: Fire engine. Sit. Fire engine. Sit.Later. ME: Can you use a sentence so I understand what you mean, sweetie? NIK: I.want.sit.fire.engine. Today. I want sit fire engine today, please, Mama. And that, my friends, is how it started to rain inside my car, forcing this mama to drive to school without being able to see a thing. It is also why I am now on a mission to take my boy to the fire station as soon as possible. Nik during one of his many hospital stays. This was his first birthday. The natural patterns and rhythms of verbal communication do not come naturally to Nik. Despite the fact that he’s had his speech device for three-plus years now, he still struggles with parts of speech and being able to put words together in a way which is understandable to “outsiders.” It’s just a part of how his brain is wired. Much of Nik’s default method of communication is “telegraphic,” meaning that he will use one word for multiple meanings and that meaning is figured out by the listener who must either be psychic or must elicit more information to determine the context in which Nik means them. I want to go to the park with Daddy when he gets home from work. I went to the park with Daddy this morning. Will Daddy take me to the park? I like going to the park with Daddy. In speech therapy, Nik is working on using “action words” to go with the things he labels. For example, when he says “Park Daddy,” Ms. K will ask what actions he can do at the park– swing, climb, etc. They work on pairing nouns with verbs and reinforcing structure and the relationship between them. It’s a painstaking process which needs to be supported consistently– not just in his twice weekly sessions with Ms. K.
Nik loves to chatter to me as we drive along to the store after school or on the weekends. I try to encourage and coach his language use all the time. Lately, though, I can tell that Nik finds it annoying. I can’t say I blame him; who likes to be grilled all the time, right? Sometimes, he flat-out refuses to participate and changes the subject to avoid the work. Others? He plays me like a fiddle and I don’t even realize it until it’s too late! We’ve done this exercise often enough so I knew, from the silence in the back seat, that he was processing the fact that chips are food and you can eat, bite, or chew food. Uncertain if I would need to prompt him with possible answers, I asked again. I heard the quiet beep of Nik activating the screen on his device to answer. Well played, son. Well played. I promised Nik we would go to McDonald’s after his therapy this morning. He was extremely excited. We don’t dine there with any remote degree of regularity; I try to save it for special times (or travel emergencies) and he loves going inside to eat. On the way to see Ms. K, Nik and I were discussing what he would have for breakfast. He suddenly got stuck in a loop and began to perseverate on eggs. Doing my best to help him break out of it, I tried to expand the language. “Nik, what can you DO with eggs?” I asked. “Nik, there are lots of things we can do with eggs, right? Eggs are food and we can…” I began to sign eat, bite and chew as possible clues for him. “Eat, eat, eat” he replied from the back seat. “Very good! That’s right. We can eat,” I signed. “Or we can Buh…” as I signed the word bite and made the sound of the letter B.
I could tell he was about to spell it out and I started to nod in approval. Yep, I’d say he’s got the important stuff down pat. Watching as Nik manages his bowl of cereal and banana, his scrambled egg and sausage, and a small glass of almond milk (hello, bottomless pit and hollow legs!). So very typical and yet…not. It occurs to me that, once I’ve prepared his food, the only assistance he needs lately is an occasional admonition to use his napkin or to slow down. To take a break from his methodical shoveling of everything into his mouth until it is overflowing. I look across the table and watch my husband watching our son. He catches my eye and we smile. “You catching all this?” I ask with a lump in my throat. His only answer is a giant smile which transforms his face into pure joy. The answer sits at our table in his very own chair with is very own place mat, dishes and utensils. It all looks so…normal. Caller: Hi, Mrs. Andersen, it’s Ms. G (the SLP from school). Ms. G: I’ve been working with Nik this morning and he’s been doing such a great job using his verbs! He said “Call Mama” so I thought I’d reinforce his excellent communication with a special treat. Hold on, I’ll put you on speaker. Me: (possibly a bit squeaky from the sudden lump in my throat). Hi, baby! Are you having a good day? Me: Did you swim today? Me: I know, sweetie. Who did you swim with? Nik: Swim Mr. Mike. All done. Walk. Goodbye. With that, he hung up Ms. G’s cell phone. And then my heart exploded and my face leaked everywhere. 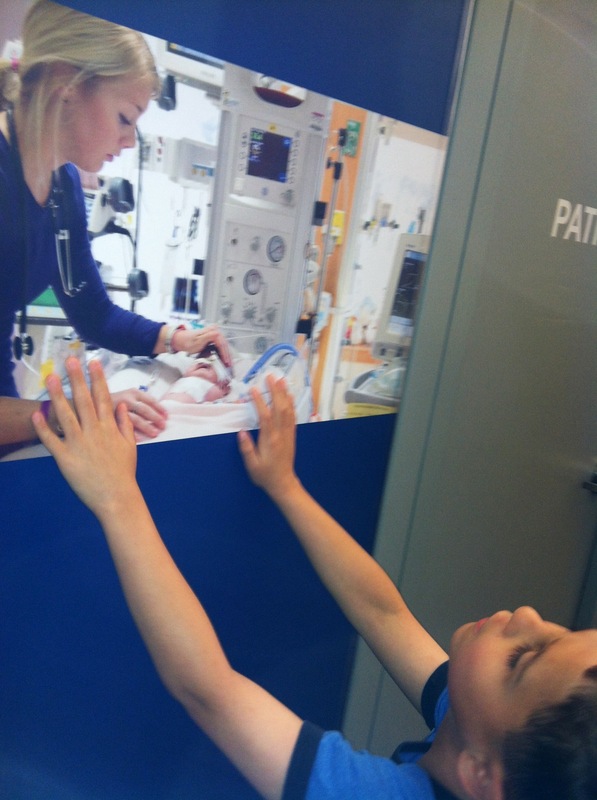 My child’s life has been wrapped up in hospitals since the day he was born. Ironically, it’s the place he is most at ease; he knows the equipment and routines. He’s not afraid to tell a doctor they didn’t look in his ears or to ask the phlebotomist for her tourniquet. (Relax, our answer is always a resounding NO!) He knows how to work the otoscopes and the blood pressure monitors, the pulse oximiters and the electronic scales and where they keep the disposable caps for the thermometers. It’s all just second nature to him and we don’t give it much thought. We’ve walked this hallway what feels like a million times through the years— many of them as recently as this past week. The pictures on the walls haven’t changed, the faces are pretty much the same. It works for us– for him, the routine, the predictability and familiarity. 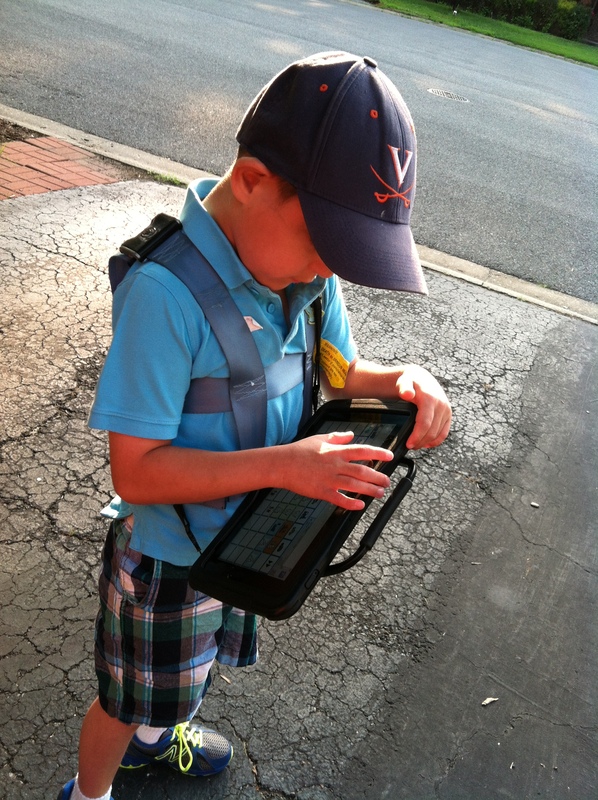 He knows Ms. M at the coffee shop who waits patiently as he orders his “cookie chocolate” with his speech device. Mr. John, the valet attendant, who always gives a smile and a fist bump and who never, ever makes it a problem if we want to play on the playground even after the car arrives. My little ambassador knows the nurses in varying departments by name and remembers the color of the stethoscope everyone wears. Dr. C? Red. Dr. D? Black with tape. Ms. T? Green…and so on. Today, we’re winding down from a very long morning of appointments on the heels of a week’s worth of appointments and disrupted routines. I can tell he’s off kilter and out of spoons. I’m kind of feeling the same way. It’s been a hard break at the end of the school year and he’s missing not only his routines and outlets, but his very best school friend. My beautiful, loving boy. So hopeful. So resilient. He stumbles against me periodically as we walk, loosely holding hands; I can feel his weariness. He looks longingly at the wagons of the other children going by. I silently berate myself for not getting a wagon for him; he’s tough but even he has his limits and his legs have been aching so much lately. If we weren’t in the home stretch heading off to get our requisite cookie for the long drive home, I would absolutely get a wagon. He stumbles again and I feel him pull away from me, his hand slipping from mine. Suddenly, I’m on high alert as he darts to one side. Instantaneously, I scan the area and evaluate the possibilities of where he is heading. I see an office door tucked into the wall up ahead and dash to cut off his inevitable entry. I beat him to the door which wasn’t his target after all. His destination was something I hadn’t even contemplated. He stops suddenly and cranes his neck upward to look at one of the many images which have become so much a part of our, my, unconscious mind. His spindly arms reach upward toward the mural – almost in supplication. One hand on the image, he is utterly transfixed. Relief washes over me. “Nik, what on earth—“ I begin. Then, I see the image on the wall. I am unable to breathe and I feel slightly dizzy. I am suddenly sucked into a vortex. Unbidden, hot tears course down my cheeks; I couldn’t stop them if I tried. 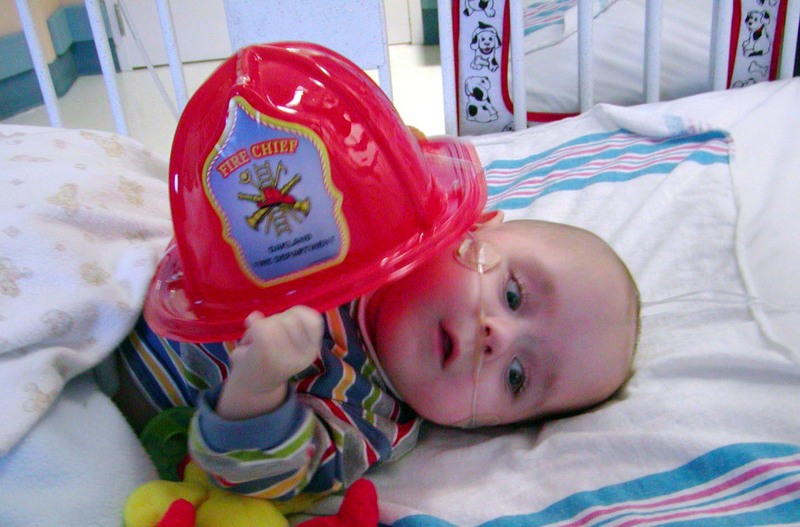 I watch as his delicate fingers reach up to touch the face of the child in the image—an infant on a ventilator. The woman – I’m assuming she’s a nurse because of the scrubs, but also because of the tender way she is cupping the top of the infant’s head—looks nothing like any of the nurses who spent so many months by our side all those years ago. Yet, suddenly, I can see their faces and hear their voices. I can hear it all so clearly—the hum and whoosh of the ventilator, the sounds of the automated blood pressure machinery. I can hear the sounds of the gentle crooning as they shushed and soothed sick babies. And the alarms—oh, God—the alarms. I can feel the sudden, urgent energy in the room when something went terribly wrong. And the tears and stricken silence following the unthinkable. I don’t think about those things often—seldom consciously. Yet, I can’t help but wonder at how deeply they have been etched into my psyche. How little it takes to trigger the emotions and memories. Nik’s finger traces over the image of controls on the ventilator. He turns his head to me as if in question, but I don’t know what he’s asking. Could he possibly remember? He was so tiny, so fragile—weighing barely more than a pound of butter. Is it even possible? I can’t help but wonder. Is his sudden, reverent fascination with this particular image on this particular day because of an offhanded remark I made to a nurse today about how little he weighed and how long he was in the hospital? Does he have those visceral flashbacks, too? I can point to specific habits and traits he has developed as a direct result of his 209 days in the NICU—habituation they call it. The way he likes to fall asleep all scrunched into a ball with his feet and head pressing against something? That’s a vestige of all those months cocooned in a bendy bumper. The way he can sleep through almost ANY sound, but cannot sleep alone in his room. The way he constantly needs music in the background of whatever it is he is doing. But, never, before this dizzying, heart aching moment, have I ever suspected he had more than hazy awareness of his time in the hospital. I have kept my own memories and emotions so neatly compartmentalized that I simply assumed he had no real memory of any of it. It’s been easier for me to cope with my own waves of remembrance that way. The thought that he might have powerful conscious memories of his difficult sojourn tears at my heart. If I, at nearly 50, still cannot process it all without falling apart, what must it be like for him? How does he process all that happened to his tiny body and tender spirit without the layers of cognition and understanding? I don’t have any nice neat wrap up to this story; it’s unfolding as I write. I’m processing as I go. Apparently, so is my son. A milestone many, many years in the making. It’s still a work in progress (especially the letter k), but it’s finally happening! His nimble fingers fly to his device to answer — name. He knows it is his. “That’s right, love, it’s your name. Can you say your name?” Knowing full well he cannot articulate the actual sounds into one fluid word, I have no expectation of a response, but he tries; he always tries. Startled, I smile widely and feel the sting of tears in my eyes. He knows he has surprised me and his face splits into an infectious grin as he claps with glee at his cleverness. My boy is nine. I don’t expect that he will ever use his laborious manual writing for more than signing his name, but I am so incredibly proud of his efforts and his perseverance; both are –in spite of the continuing state of flux of his health and his daily challenges– such constant facets of my amazing child. The only things more constant are the love and pride I have for him. Today, Wednesday, March 6, people around the world will unite their communities to Spread the Word to End the Word®, as supporters participate in the 5th annual ‘Spread the Word to End the Word’ awareness day, aimed at ending the hurtful use of… the R-word (“retard(ed)”) negatively impacting people with intellectual and developmental disabilities (IDD). Language affects attitudes. Attitudes impact actions. Special Olympics and Best Buddies International encourage people all over the world to pledge now to use respectful language at www.R-word.org and build communities of respect and inclusion for all people. I hope you will add your voice in support of these efforts. Your life may not be graced by a loved one with an intellectual disability, but I am sure you know someone whose life is touched on a daily basis. The next time you hear someone using the term as a slur, please speak up. For your friends, your loved ones… for my child. You may have noticed that my writing has fallen off here. Quite a bit. Yeah, I know, I know. I don’t need to beat myself up about it, it’s my blog, blah, blah, blah. The truth is, I haven’t been writing because I haven’t known how—or what—to share about the changes happening with my son. The words are jammed up inside my head, warring with the feelings inside my heart. I have discarded multiple drafts in an effort to find the words I need. I wrestle with what I want to say and how much I feel comfortable sharing. I still don’t have the answer; I am outside my comfort zone. The irony is not lost on me. Ever the consummate over-sharer— not afraid to tell my story to anyone who will listen, I have struggled with what to reveal. I’ve been grappling with finding my own truth and having to confront my own biases all while trying to find a new equilibrium. I have been forced to examine and to reframe my vision for the life I thought we would have. The life I thought he would have. It’s very much a work in progress as we continue to redefine, reshape and work our way through the morass of emotions and information. When my son was born extremely prematurely, he was substantially smaller than his gestational age and had a number of identifiable health conditions in need of immediate treatment –either with medications or surgeries. Life—mine and his—became about surviving another day, making it through another crisis. Over the course of his 209-day hospital stay, and even after he came home, the focus was on making it through; through another season, another health crisis—whatever curve-ball life threw our way. At that point in time, there was no way to predict how the cards would fall and no way of knowing what his future might hold. Many professionals told us there were still so few children like ours who were old enough to really have enough data to be able to predict with any degree of certainty. So, we simply hunkered down and did the best we knew how to do with the minimum of supports we had. All we knew was that we were not quite out of the woods but not quite fully in them. When you don’t know what you don’t know and the prospect of knowing certain things is, well, scary, it’s all too easy to want to believe the well-wishers and the miracle-sellers who predict your child’s miraculous growth and feats of development. So, you put on the blinders and tuck your chin down and simply soldier on—hoping for and working toward the best, whatever that turns out to be. In the absence of even a hint at the longer view, we simply clung to hope and pushed our worries aside, taking it a day at a time, an issue at a time. When our son was ultimately diagnosed with PDD-NOS, it gave us something to hold on to and provided a new context through which to view everything else. As time progressed and some of the more emergent health issues began to resolve or remained stable, we hit a kind of developmental sweet-spot. Our son began to make tremendous progress and was rapidly gaining many skills which had been so severely delayed. In a seemingly short time, he blossomed from the child who couldn’t even sit up or roll over and who relied on a tube for all his nutrition, to a child who could walk and run, climb and eat, and who had taught himself letters and was showing signs of spelling and early reading skills emerging. With that swelling surge of hope, we began to really push for supports and look for signs of academic progress. Some early literacy skills were emerging, multiple word sentences constructed on his speech device – there were glimpses; glimmers of dazzling progress. Which is where we have been for a while now. I’ve struggled to understand for myself and to try to articulate for others, the degree to which things have stagnated; there’s been some significant regression in some areas. It’s best summed up in a brief conversation I had with our developmental pediatrician this week. Can I pretty much assume that (1) my son doesn’t test well and the tests aren’t completely accurate and (2) that there’s probably *some* kernel of accuracy there which speaks to a larger issue? The one we think we are seeing? DR: (wrinkling her nose in a sympathetic grimace, nods her head) Yeah, I would make that leap. Let’s make an appointment to talk about it and find a new way forward. Hope is important; it is vital. But so is the ability to see beyond the heart’s desires, to peel back the thin veil over your fears and really look at what is in front of you. I’ve been in that process for a while now –none of this is new data; it’s just data my husband and I have finally been ready to see in a different light. The process of getting to this point has been emotionally messy. It’s been painful to confront our own prejudices. Different words will not change my beautiful, smart, funny, loving child. Nothing will. And yet, the truth of those same words cuts me to the bone, laying bare the fears and grief I’ve held at bay for most of my son’s life; I am the one it changes. I am the one those words challenge. I hope I am able to meet it with half the grace, determination and heart with which my son has lived his entire life.